With an estimated 120 to 230 adults remaining in the wild in south Florida, Florida panthers are one of the most endangered mammals in the country. Defenders of Wildlife’s efforts to help the Florida panther survive started four decades ago when we lobbied for the species’ inclusion under the federal Endangered Species Act. We have been fighting for panthers ever since — to secure and protect the large interconnected tracts of wild land they need to expand their range northward, to foster understanding of these wide-ranging and secretive predators and to address a leading cause of panther deaths: collisions with vehicles while attempting to cross roads. In recognition of our longstanding commitment to panther recovery, Defenders serves as the conservation representative on the federal Florida Panther Recovery Implementation Team. We’ve made a lot of progress over the last 40 years — in the 1970s biologists weren’t even sure we still had Florida panthers left. And then a few were discovered in south Florida, and it is estimated that the population may have dipped to 12 to 20 individuals at its lowest point. Even though the population has grown steadily since a genetic restoration program was undertaken in the 1990s, it is still small and endangered, largely because of loss and degradation of habitat. 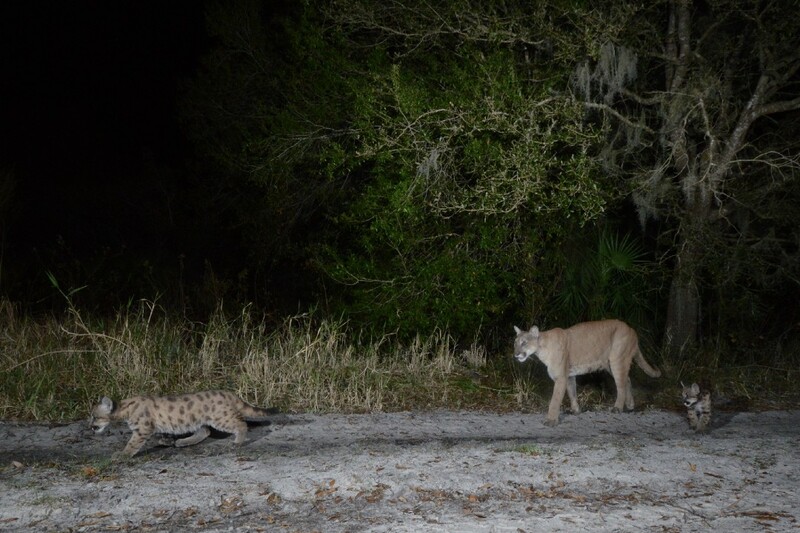 Today, the Florida panther is at a crossroads: in the last few years, biologists have documented female panthers and kittens north of the Caloosahatchee River for the first time in more than 40 years, a major milestone in panther recovery. But, at the same time, Florida has become the third most populous state in the country, bringing accelerating development and new roads. The Florida panther once ranged throughout the southeastern United States but today occupies less than five percent of its historical range. In order to keep the panther on a path to recovery, we need to share the landscape with this large carnivore and we must avoid and reduce conflicts that inevitably occur as people and panthers become more numerous within the same space. Through partnerships, education, research support, public outreach, and advocacy, Defenders is working to foster understanding of Florida panthers and to help people share the landscape with these endangered predators. We launched our Florida panther coexistence program in 2004 to respond to an increase of panther depredations on livestock and pets. 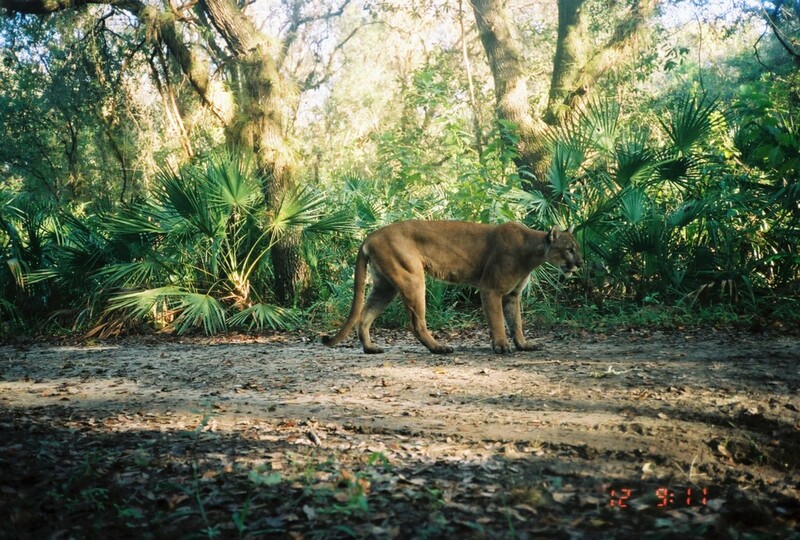 As part of Defenders’ “Year of Coexistence,” March is focused on the Florida panther. School children selected the Florida panther as the official state animal in 1982, and the Florida legislature designated the third Saturday in March as “Save the Florida Panther Day,” which is March 16 this year. The Florida Panther National Wildlife Refuge, established to protect the panther and its habitat in 1989, hosts an annual Open House to celebrate Save the Florida Panther Day. The refuge hosts activities such as orchid walks, swamp buggy tours, panther presentations, and other talks and lessons. Defenders is very busy at this time of year engaging in outreach and providing technical assistance to homeowners who live in or near panther country. Our Coexistence Coordinator and volunteers help increase awareness and through presentations and other events, we engage with thousands of adults and children. South of the Caloosahatchee River, we participate in festivals and other outreach events, some of which draw tens of thousands of people. North of the river, Defenders expanded our panther outreach to the areas where females are beginning to disperse. In 2018, we gave more than 20 presentations attended by more than 1,000 people from environmental clubs, homeowners’ associations, rotary clubs, and AARP. 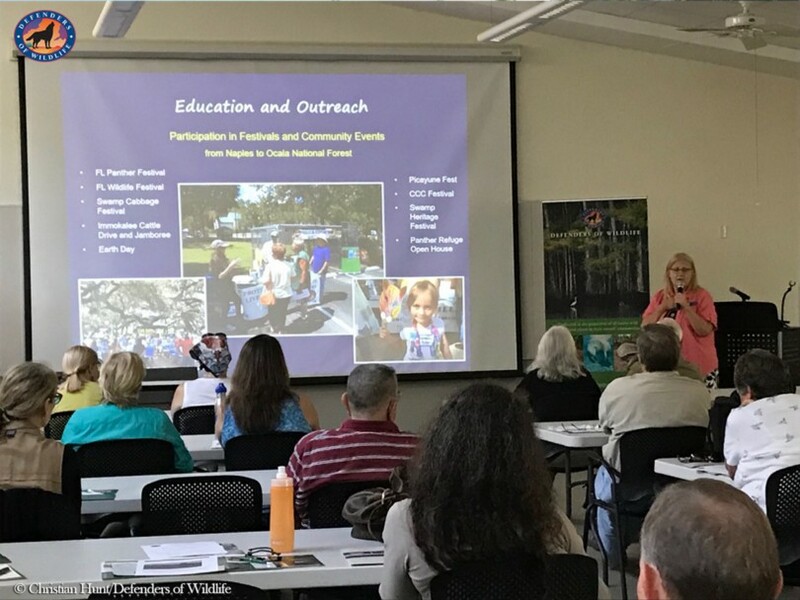 We also hosted a Florida Panther Outreach Workshop for more than 45 participants in April at Archbold Biological Station to discuss panther range expansion and prepare activists to help with outreach north of the river. Over the years, we’ve hosted educational workshops, initiated demonstration projects, and distributed materials in rural residential areas on responsible homeowner practices for safely coexisting with panthers. 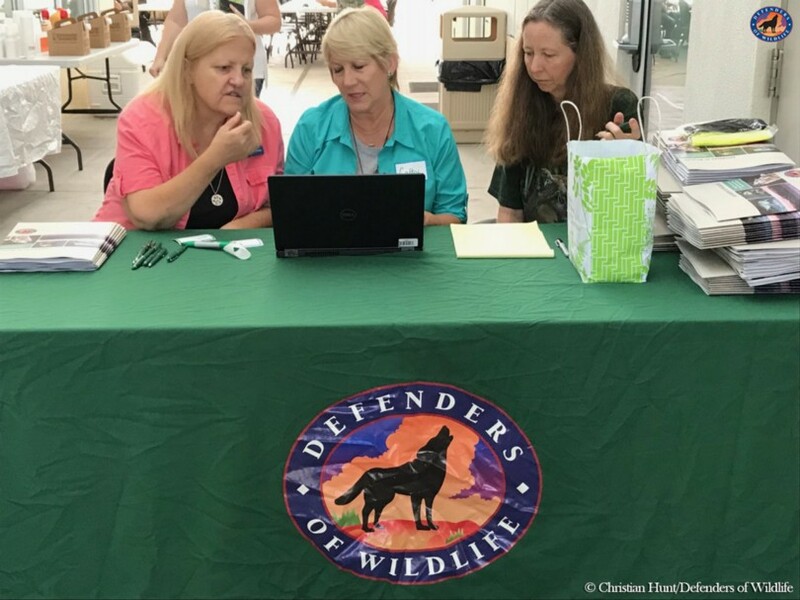 We’ve recruited and trained volunteers for the Panther Citizen Assistance Taskforce, a group of citizen scientists and activists who share information about panthers and protecting pets and livestock. 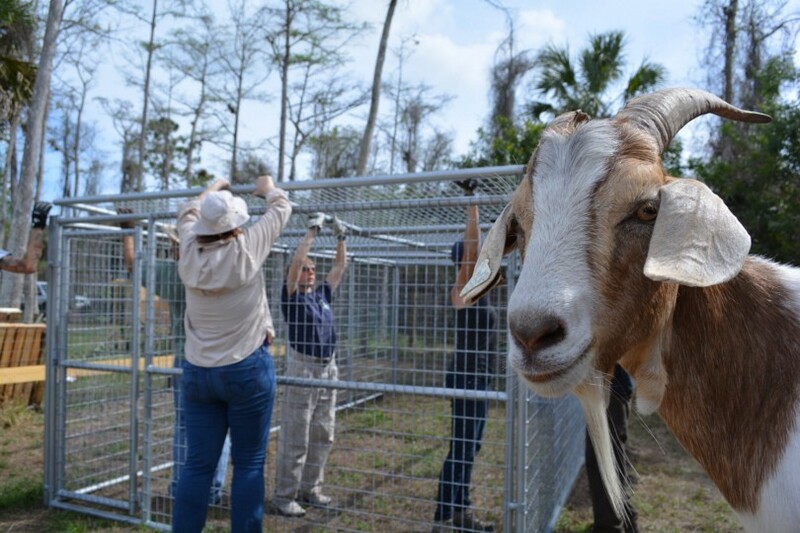 Since establishing our predator-resistant livestock protection enclosure program, we have helped fund and construct more than 30 enclosures to protect people, pets, livestock, and panthers. 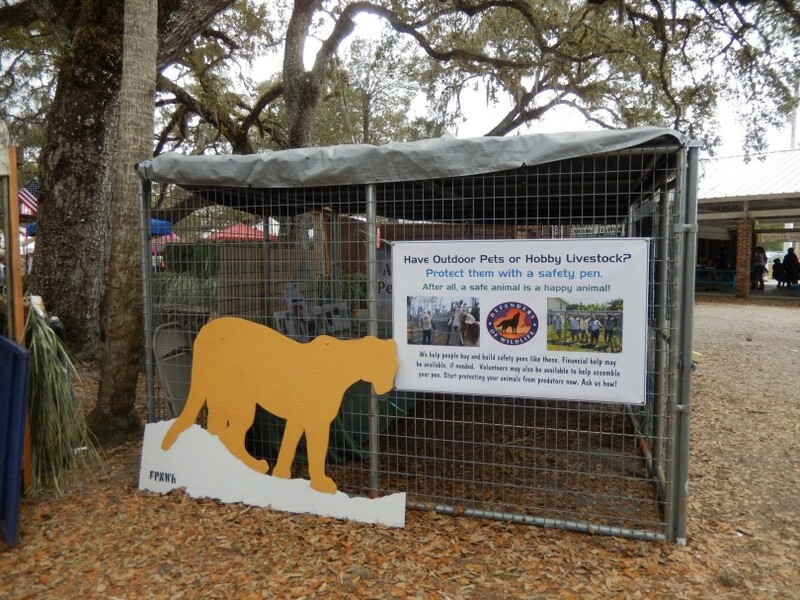 In 2011, we helped initiate the annual Florida Panther Festival, an event now hosted by the Naples Zoo to build awareness and acceptance of panthers. Large landowners, some of whom own tens of thousands of acres, have also experienced conflict with panthers that occasionally prey upon calves on cattle ranches. As part of the Florida Panther Recovery Team, we work with these landowners to protect large interconnected areas of habitat and expand acceptance for sharing the landscape with panthers. To reduce conflict, we work to improve two federal programs administered by the U.S. Department of Agriculture: one compensates landowners for loss to a federally protected species and the other provides funding to landowners who maintain their land in ways that benefit panthers (e.g. providing good habitat and wild prey). We also work to help the wide-ranging panther cross dangerous road segments. The biggest human-cause of panther mortality is being struck by motor vehicles as panthers travel great distances in search of territory, mates, and food. In 2018, 26 panthers were killed while crossing roads. As part of the Transportation SubTeam of the Florida Panther Recovery Team, we helped develop the Southwest Florida Panther Hotspots report and maps to help guide decision making and funding allocation for wildlife crossings and other tools to allow safe passage across dangerous road segments. We also provided extensive input to Florida Department of Transportation on revisions to its Wildlife Crossing Guidelines. For many years, we’ve been involved in facilitating the installation of wildlife crossings and slower speed zones and advocating for conservation-minded transportation planning that considers the dangers motor vehicle traffic and habitat fragmentation present for panthers and other wildlife. Panthers are slowly recovering from the brink of extinction thanks to the Endangered Species Act and successful conservation programs. Their population is growing and they are expanding their range. But the same increase and expansion can be said about the human population in Florida, and at a greater rate. As human communities encroach on the wild lands that remain, people are coming into closer and closer contact with wildlife like the Florida panther. Defenders recognizes that helping people coexist with the Florida panther is vital to building the acceptance and support needed to save the species. We are proud of all that we have accomplished so far, and we are optimistic about the panther’s future in Florida. Please save the Florida Panthers! Thanks for raising awareness and educating people about the Florida Panthers and all wildlife.I am proud to be a member of DOW. Nice work Elizabeth. As always, very informative.